Many of us go through life with our heads down, focused on getting ahead and achieving our goals – a good job and career, a beautiful home, a lasting relationship, and maybe even a family. While these are all great goals, many of us wake up one day, look around, and ask: is this all there is to life? We realize that something is missing, but we aren’t quite sure what it is. Jennifer Monahan has been there. She spent many years climbing the corporate ladder as a business executive and ... See More strategy consultant. A chance meeting with a Mayan shaman caused her to begin to reassess her life, but it was a bad accident that left her stuck on her couch for six months, on crutches for eight, and in a cast for fourteen months that motivated her to make drastic changes in her life. 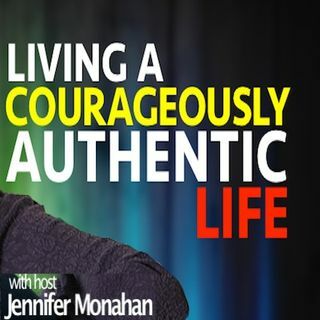 Living a Courageously Authentic Life (28) What is holding you back?